I am seriously debating whether or not I should just write the word “no” and end this review, but I figure that wouldn’t be fair, and that I should give some real context into a) why I watched this movie despite universally negative press and b) why I hated it. The answer to the first inquiry is simple: I believe that Adam Sandler has made good movies in the past, and is talented. The problem is that a lot of his recent works, as many have observed, are the summit of laziness, treading over knowingly subpar material. He even reportedly said at one point during the production of Jack and Jill to a stunned Al Pacino something to the effect that they shouldn’t worry about how stupid the material is, since his fans will eat up even his worst stuff. I still like the man’s early work, and believe that anyone who would claim he is devoid of comedic talent isn’t watching carefully enough. That being said, I don’t watch his new movies in theaters (or at all, recently). But The Ridiculous 6 premiered on Netflix, and so I didn’t have to leave my house or pay extra money to see it. The second question takes a little longer to answer, and to delve into it, we need to step back and examine the core of the film itself. Set in the old West, the movie sees Sandler playing Tommy Stockburn, a white man who was raised by a tribe of Native Americans. His long lost father Frank (Nick Nolte) has returned to his life shortly before Tommy’s wedding, only to be kidnapped by a gang of thieves over a fortune of $50,000. Tommy, nicknamed White Knife, uses a set of clues from conversations with his dad to find him, and along the way, discovers a few eccentric individuals who are his half-brothers, all fathered by Frank to different mothers. With a Mexican burro rider named Ramon (Rob Schnieder), the mentally deficient but ruthlessly energetic Li’l Pete (Taylor Lautner), the isolated and mute Herm (Jorge Garcia), a half-black piano player named Chico (Terry Crews), and Danny (Luke Wilson), a disgraced ex-bodyguard whose last job was protecting Abraham Lincoln during a visit to Ford’s Theatre, the group calls itself the Ridiculous 6, and traverses the terrain, searching for their father and encountering an increasingly bizarre series of misadventures in the process. Opening up The Ridiculous 6 to name members of its supporting cast makes this disaster of a movie all the more painful. We have great names like Steve Buscemi, Harvey Keitel, Norm Macdonald, Jon Lovitz, and Chris Parnell in this film, and yet it’s still an excruciating experience. A scene in which Parnell’s character is blasted with explosive projectile feces from Ramon’s donkey is rather metaphoric of what this script does to its cast. Clocking in at a near-unbearable 119 minutes, I can’t even say that the proceedings are mercifully short, because, well, they’re not. There are a few amusing moments, like a sequence in which the titular group plays witness to the invention of baseball and the development of the quirks of the game’s rules. The premise is simple, but it works. That’s more than I can say about roughly anything else in the entire production. As you could gather, having only a few good jokes in two hours does not make a comedy very appealing. 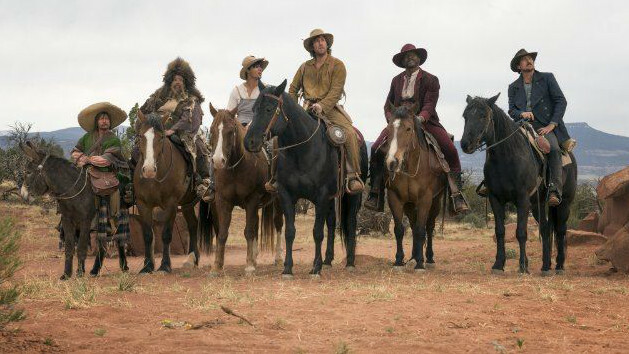 The Ridiculous 6 fails to engage the viewer in any way, to the point where I wouldn’t say I watched it, but rather stared at the screen for most of the runtime. It’s atrociously bloated, virulently indolent (especially considering the talent involved), and unbelievably formless, ensuring that you have a bunch of characters onscreen that you couldn’t care less about, resulting in something mindnumbingly dull, carrying a certain degree of prioritizing the making of the project over creating a movie that’s actually watchable. Seeing something that looked like fun to make doesn’t automatically guarantee that it’ll be fun to view. Adam Sandler has said that one of the main reasons he makes movies is to hang out with his friends. Indeed, there is a certain troupe that spreads through most of his works, from a set of writers and directors, as well as a massive group of comedians that have supporting roles. One would think that if people who know each other so well can collaborate and create something great. I think Sandler will have a comeback someday. He will concentrate his talent into a film that works great for those making it, and those watching it. The Ridiculous 6 isn’t that film.